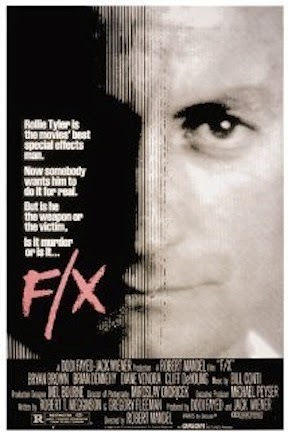 The movie F/X is about a special effects artist who is framed for a crime and uses his own particular genius to turn the tables on his enemies. It might sound a little campy and there's no doubt that you have to accept its premise with belief well-suspended to fully embrace it, but it has everything you could ever want in a first-rate thriller: it's exciting, suspenseful, exceedingly clever, funny at just the right moments and is loaded with enjoyable characters and situations. Featuring a number of top New York theater actors of the day in supporting roles, it also boasts unusually good acting (though Brian Dennehy as an acerbic and relentless cop steals the show).